Let’s go back to the beginning of time and work our way up. Was the universe created in six days? The Bible says that God created the earth and the universe in six days in Genesis chapter 1 and 2, and on the seventh day God ended His work and He rested. This is simple enough. So we know now that God divided the light from the darkness, He called the light day and darkness night, and the evening and the morning were the “first day,” therefore, a day, according to the Bible, is not a thousand years but literally one day. Now, some will argue that the earth could not be 6,000 years old. To that I say, the Bible never claimed to be 6,000 years old, but the Bible does say that God created the universe and the earth literally in six days. According to answersingenesis.org, from this “birth certificate” God gave us, we can trace the age of the earth. Did man co-exist with dinosaurs? The verses that follow in Genesis chapter one goes on to describe how God brought about His wonderful creation one day at a time. Now, let us fast forward a bit. We know that God formed animals of all types. Does this include dinosaurs? Of course! We know they were around and were fascinating creatures because of their stature. Many of these dinosaurs, as I said, were very large. For example, the Argentinosaurus measured 100-150 feet in length from head to tail and weighed approximately 100 tons. We know this because of documented archeological finds. Therefore, if animals, including dinosaurs, were created within the six days and Adam was created within the same time frame, then it is safe to say man and dinosaurs roamed the earth together at the end of the sixth day and not with millions of years apart as evolutionist claim. Oh wait, if that was so, then dinosaurs would eat man; wouldn’t that be right? Let us go back to Genesis 1. Now we know that God gave Adam dominion over all the animals and they were to eat from fruit-bearing trees and every green herb; this was to be their meat. Therefore, the answer to this question is, no. Dinosaurs did not eat man and man did not eat dinosaur, not while they were being obedient to God anyhow. 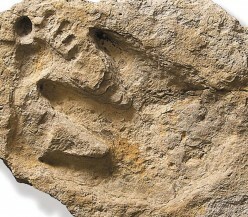 Alright, now that we established that dinosaurs and man walked together and they did not eat each other, let’s move on. 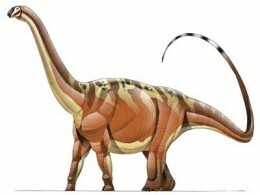 We also know that many of the animals were very large in size, such as the dinosaur called Argentinosaurus. We know this because of archeological finds. 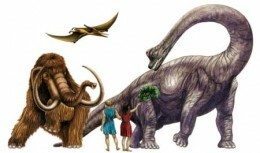 We also know that not only dinosaurs were large but many species of plants were also huge in size. Therefore, if many dinosaurs and plant life were extremely large, would it be possible that God created Adam somewhat large in stature as well? That is, large by our standards and not God’s (now you see where I’m heading). The bible does not say how large Adam was but we do know for certain that Adam was to have “dominion” over the animals. Nevertheless, for the sake of argument, if Adam was given charge over all the animals and told to “subdue” the earth, would this not be a possibility? In man’s limited rational mind it is not possible. Now, imagine Adam as being an average 5-foot 10-inch man, by modern standards, standing next to a 120-foot in length, 100-ton dinosaur and having dominion over it. It’s pretty laughable, wouldn’t you agree? Then if dinosaurs co-existed with man and things were extremely large back then, why have no human bones been discovered alongside these dinosaurs? Well, let’s see. There is no mention of any discoveries by the evolutionary scientific community of any species of giant men, but does that mean that they did not exist? The Bible says they did and so does Dr. John C. Whitcom in his book titled “The Genesis Flood;” it is a book with a bit of dated scientific research, but, nonetheless, backed by creationist scientific evidence. It may be something you may want to read in your spare time. Suppose Adam was a giant. 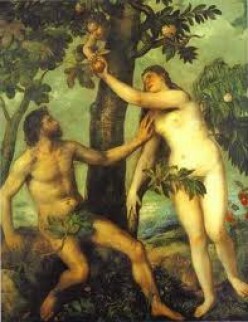 Then Eve, who was taken from his rib (Genesis 2:22), must have been a giant as well. 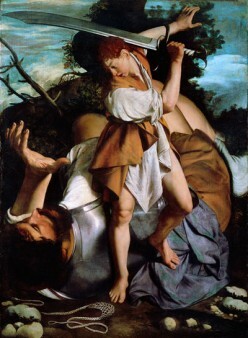 The children that followed from Adam and Eve— Cain, Abel, and Seth, were born as giants. Now if you have read the Bible, you know that Cain murdered Abel. Cain was murderer, a fugitive, and a vagabond of no good character, and as the son of Adam, he was a giant. Cain and his wife procreated and populated the earth with more giants and from what we already know of Cain, Cain and his family were probably corrupt in the eyes of God. Seth also procreated and populated the earth and we know this because Noah descended from Seth. That would mean that Noah was a giant and so were his sons, Shem, Ham, and Japheth (Genesis 6:32) and all their wives. You may say the Bible does not say that Noah was a giant. But let’s look back at Genesis 6:1-4. God said, “there were giants in the earth in those days and also after that.” After what? 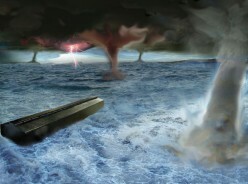 After the flood (read the whole chapter). So before the flood and after the flood there were giants. How did the giants come to be after the flood if everything that had breath in the earth ended except for Noah and his family? Well, let’s see. We know that there were giants after the flood because the Bible mentions giants in the Old Testament in several places. In order to find their origin you would have to trace their lineage. I will provide a couple of examples in an attempt to trace their lineage. “For only Og king of Bashan remained of the remnant of giants; behold his bedstead was a bedstead of iron; is it not in Rabbath of the children of Ammon? nine cubits was the length thereof, and four cubits the breadth of it, after the cubit of a man.” The KJV uses the word “giants” and the NIV and other Bible versions use “Rephaim” for giants. According to Brown, Driver, Briggs, Gesenius Hebrew Lexicon- KJV (Strong’s number 5747), Og, was an Amorite and the remnant of a giant race called the Rephaims. Another Rephaim mentioned in the Bible is Sihon the Amorite, king of Heshbon (Deu 2:24). The Rephaims can be traced as far back as Genesis 14:5. The Rephaims were one of several races of giants mentioned in the Bible. Rephaims could also refer to those who lived in Sheol. The singular form of Rephaim is Ha raphan and it is believed by many that the Rephaims are the descendants of Rapha or Raphah (1 Chr 20:6-8). Yet some scholars consider Rapha or Raphah to be an eponym. Therefore, the origin of the Rephaims is a bit hard to trace because Rapha could be an eponym, it can also indicate that Rapha was the father of the Rephaims, or that the Rephaims were the residents of Sheol. However, if my interpretation is correct, and Og the king of Bashan was an Amorite, a remnant of the Rephaim (race of giants), you will find the origins of the Amorites in Genesis 10:15-16. You will also find the Amorites descended from Canaan, the son of Ham. Ham’s lineage is mentioned in Genesis 10:6-20. And Ham was the son of Noah. Some say that Og was a 3000 year-old giant that stowed away in Noah’s Ark to explain why there were giants after the flood. That is a myth. Zamzummites or Zamzummins, as the Ammonites called them in Deu 2:20. They were also known as Zuzims, and Zuzites (Gen 14:5), and were also considered Rephaims. Another example of a giant was Anak. Anak had three sons: Shesha, Ahiman, and Tamal (Num 13:22; Jos 15:14). According to Easton’s Bible Dictionary, the Anakims were a nomad race of giants descended from Arba and Arba was the father of Anak. This race of giants dwelled in the south of Palestine near Hebron, formerly known as Kiriah Arba or city of Arba (Jos 14:15). 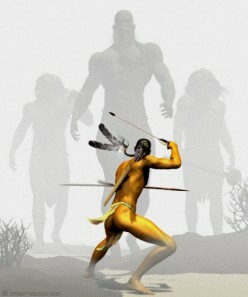 The Anakims were a Cushite tribe of the same race as the Philistines and Egyptian shepherd kings. You will find the origins of the Cushites in Genesis 10:6, 7. You will also find the Cushites descended from Cush, the son of Ham. Ham’s lineage is mentioned in Genesis 10:6-20. And Ham was the son of Noah.